Designed for beginners, intermediate players, or simply anyone who wants a digital piano in their home, the Roland RP501R provides 11 piano tones, a whole host of practice features, built-in rhythm accompaniments, and more. It also allows for connectivity to iPad and Android apps over Bluetooth streaming. 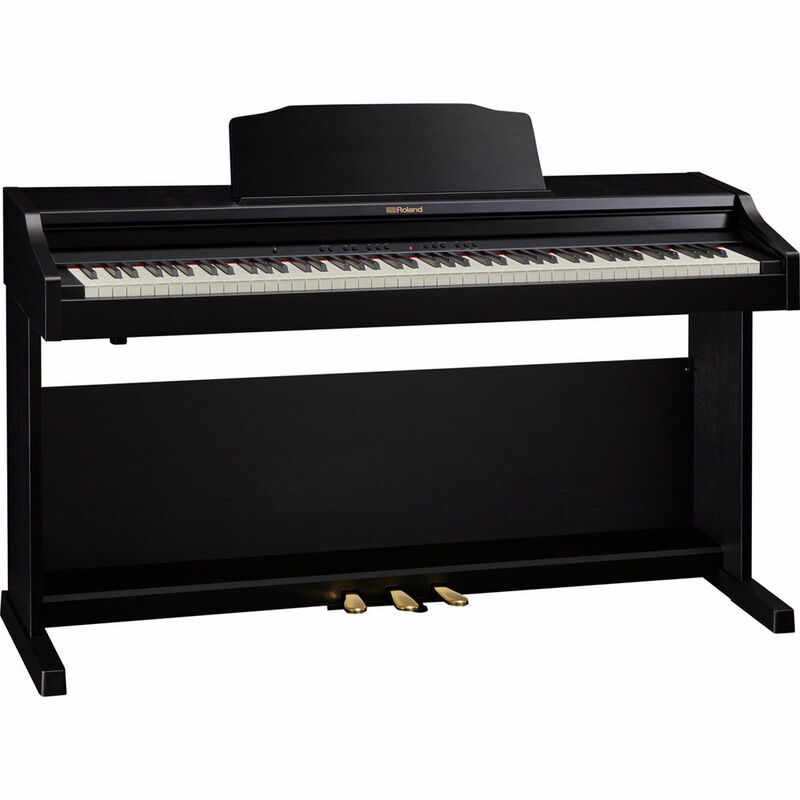 The RP501R features 88 keys that allow for expressive play, giving you a feel that’s weighted and reminiscent of ivory. Its pedal, too, offers dampening that emulates the pedals of real grand pianos, allowing for half-pedaling and other techniques. If you wish to practice through headphones, the piano features an effect which creates an immersive, multi-dimensional soundstage. This piano is styled in black and ships with an included bench. With onboard SuperNATURAL technology derived from Roland's flagship digital pianos, the RP501R delivers a rich, expressive tone. An array of built-in speakers ensures that sound fills the room. The PHA-4 keyboard responds to the nuances of your touch, while the Progressive Damper Action pedal lets you perform traditional techniques with all the feel of an acoustic pianist. The RP501R captures the authentic sound of a traditional acoustic piano, yet also offers over 300 additional sounds to foster creativity. The onboard Rhythm feature lets you jam with your choice of 72 backing styles in various genres (pop, jazz, and more.). Don't worry—the band will follow all your changes. Bluetooth, MIDI, and USB connectivity give you access to a wealth of piano apps such as Roland's Piano Partner 2, which displays internal songs as sheet music and helps you work on your sight-reading. Additionally, an onboard metronome improves your sense of timing before you assess your progress with the onboard recorder. Audio and MIDI playback (from USB memory) lets you jam along with your favorite songs as they play through the piano's speakers, while Twin Piano mode allows you to play in the same key range side by side with a duet partner or teacher. If there's a song you want to learn, download it to your tablet from Sheet Music Direct, or install the piaScore app for free access to 70,000+ classical music scores. By pressing the piano's pedal, you can even turn the pages of the score on your tablet's screen. Box Dimensions (LxWxH) 65.0 x 23.0 x 14.0"